Found at a Church Thrift Sale. It was headed for the dumpster if it didn't sell. Rescued. Repaired. It is not sturdy enough for every day use but would be a great garden display chair for a porch. Here is the chair after DH did many repairs. This is 'how it arrived', details in the following three pictures. The missing spindles are taped under the chair (how lucky). Maybe a bit of light painting, maybe I will leave it alone. Love the chippy look. It just speaks to another era, doesn't it. Love the find! Great repairs, looks like it was always that way...I love the chippiness, too! Beautiful chair. Love the age on it. Excellent repair job - I like the chippy look myself. Just goes to show - there's always hope! Nice to see your repair job! I am sure you can find a nice spot for your rescue. Have a happy week! 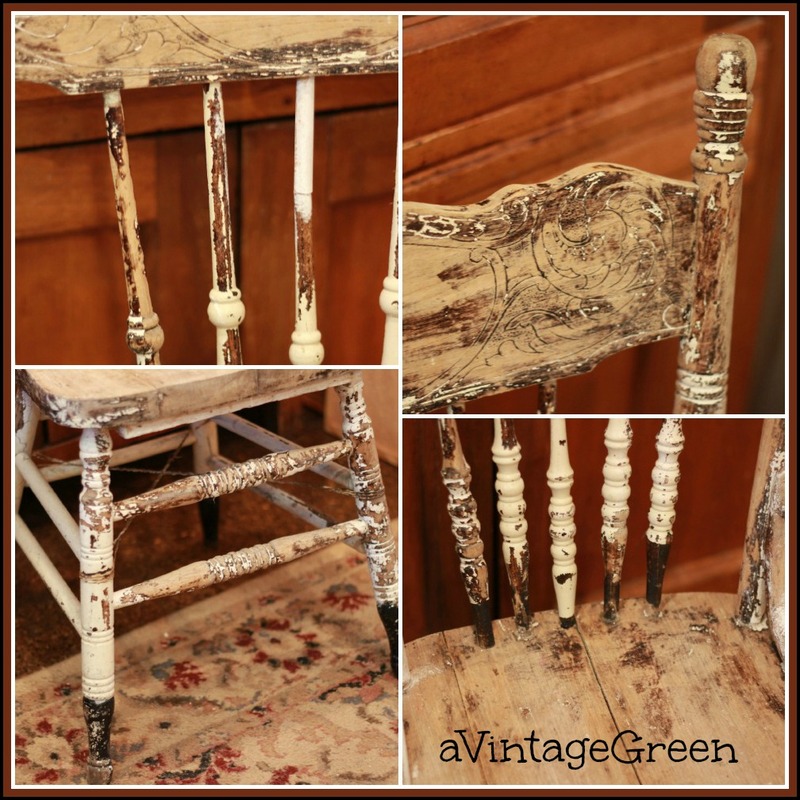 i already like old chairs...they just speak to me and have such stories in that old wood. Nice find!!! It will be charming with plants on a porch. 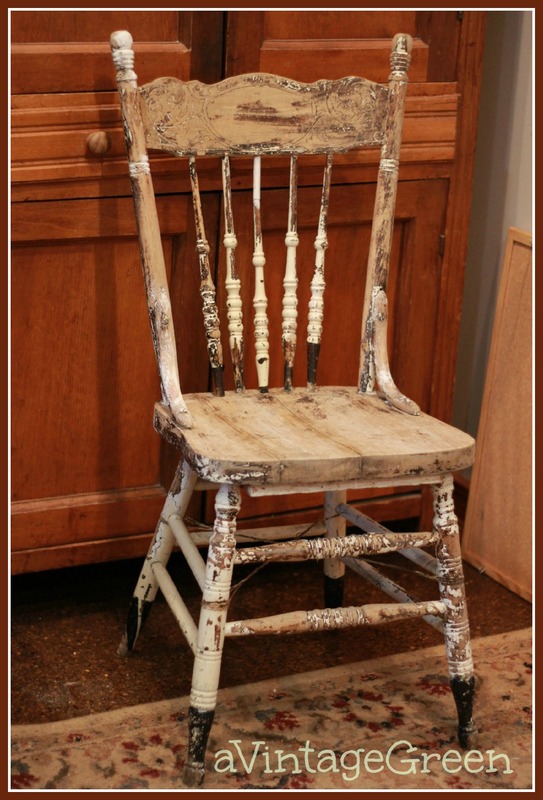 I love old chairs like this. Great work. It is so deliciously prim, I think I would only wax it! Lucky you - someone taped the spindles with it. Another orphan saved. He did a great job. 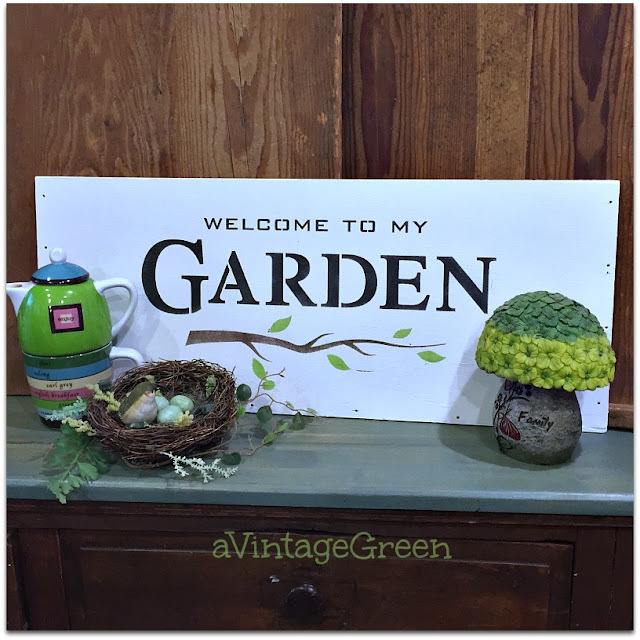 It would look lovely on the porch with a basket of seasonal flowers. I commend your hubby for putting forth the effort. Mine would question going through the trouble. In the end it's totally worth it! Who needs repairs for such a lovely find. I love the chippy, crusty look and I have just the place in my pink and white room for it. It would look perfect in front of my window with a stack of magazine reads on it. So, love it! That chair is a beauty! Chippy and all - it is gorgeous! Isn't it amazing how something so seemingly beat up and broken can be so beautiful? That is the perfect front porch chair. You did an amazing job sprucing it up. I have a couple of chairs that are shaped like those and I would like to cut some of the back down to make a vanity chair. Anyone have any ideas how to go about that? So glad you saved it! People spend huge amounts of effort to achieve that chippy, timeworn look on new pieces -- it's wonderful that you saved a true vintage example. 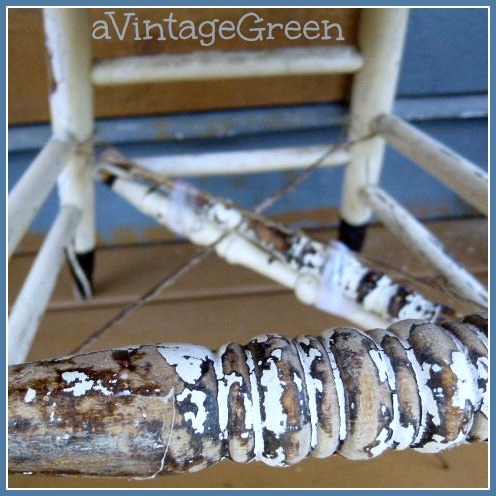 Oh I just put two chippy paint chairs just like yours in my shop...hope they gone when I get there today. Thanks for sharing yours at my party...awesome makeover. WHat a wonderful rescue. It looks great. Love all that chippyness! Wow, he had quite a job to do there, but it was worth the trouble. We put one in our booth last week and it was gone in 2 days. I've got to scout the shed to see if we have any more to take in! 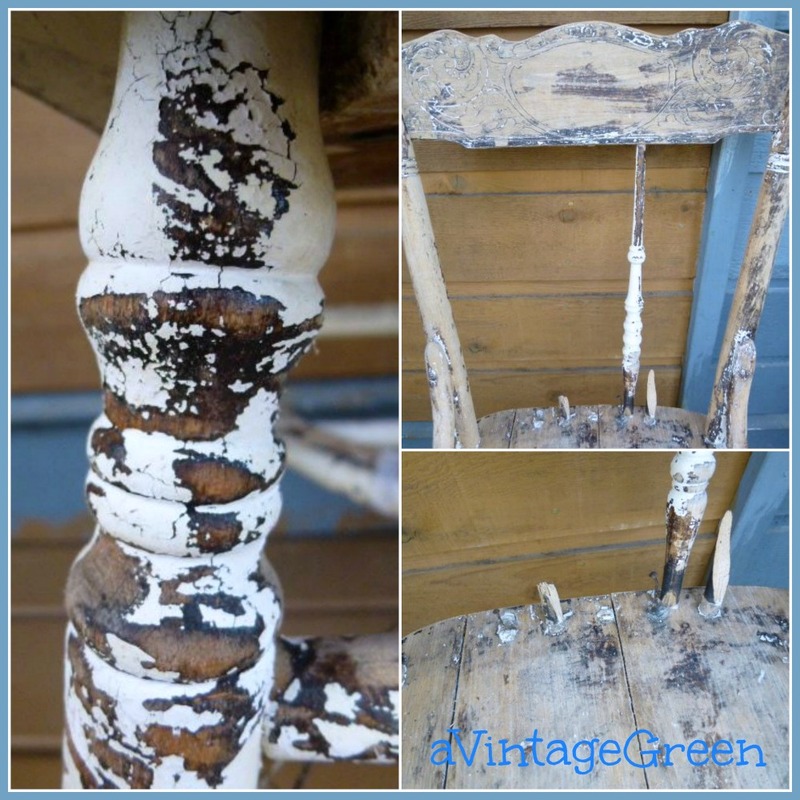 I have a chair similar and the spindles are broken as well. I was just going to put it out on the curb but now I think I am going to use it in my garden. Thanks! Stopping over from under the table dreaming link party. Oh, I just love this. Think of the stories it could tell! Very nice rescue! I use to have one like this, wasn't in bad shape really. Just needed some tender loving care, good cleaning, wood wasn't in bad condition, had it in the garage, and while I was out one day hubby & son were cleaning the garage out. They thought it was garbage, and put it in the burn pile with all the other wood from there. I was soooo upset with this! They have learned to ask first before doing that again. So glad you rescued it and repaired it. 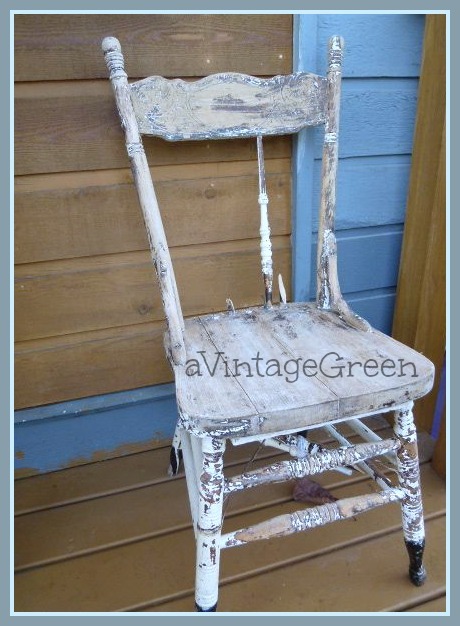 Maybe some Miss Mustard Seed Milk Paint without the bonding agent so it chips more. Thanks for sharing at Silver Pennies Sundays! Great rescue Joy. Spindles are so hard to repair and your DH did a fantastic job of getting them back together. I bet it will sell quickly in your shop. Just display a nice plant in it. This reminds me I should seal the one I have sitting outside on my back porch. Thanks for sharing. I can just see it with a big pot of ivy sitting on it. GREAT SAVE. Wow! Your hubby did an amazing repair job. I think it looks great with the chippy paint. Thanks for sharing at Restyled Sundays.